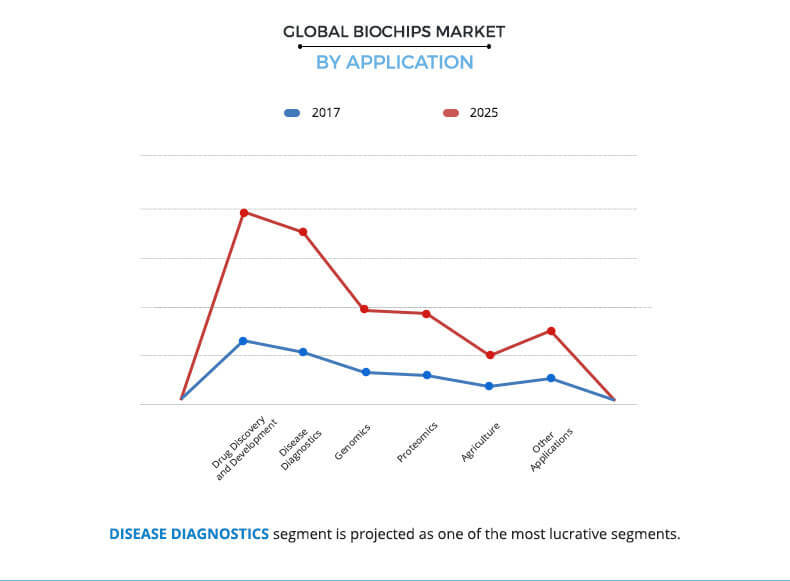 The global biochips market was valued at $9,037 million in 2017, and is projected to reach $21,419 million by 2025 at a CAGR of 11.2% from 2018 to 2025. Biochip is a miniaturized medical device used in molecular laboratories to carry out several biochemical reactions simultaneously. It can rapidly screen a number of biological analytes for an array of applications such as disease diagnosis and detection of hazardous biological agents in a system. It is designed on the basis of microarray and microfluidic technologies, among which digital microfluid biochip is highly efficient, and has gained significant popularity in the biochemical field. Increase in prevalence of cancer, immunological disorders, and viral infections majorly drives the growth of the global biochips market. Other factors that boost the market growth include rise in geriatric population, increase in number of biochip applications, and high adoption of personalized medications. However, factors such as high cost of biochip and lack of knowledge about it majorly in emerging nations hamper the market growth. Conversely, rise in R&D investment as well as government funding and high potential in untapped markets in emerging economies are expected to provide lucrative growth opportunities for the market. The global biochips market is segmented based on product, application, end user, and region. On the basis of product, the market is divided into DNA chip, protein chip, lab-on-a-chip, and others. 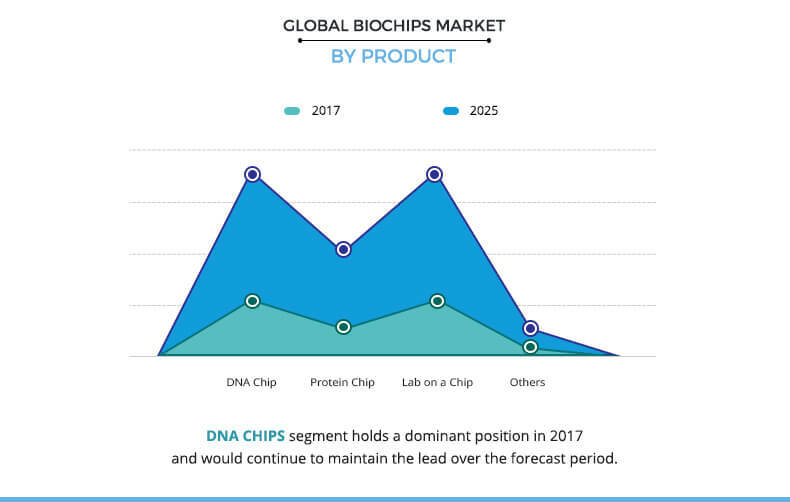 The DNA chip segment accounted for the largest market share in 2017, and is expected to continue this trend throughout the forecast period, owing to high adoption of DNA chip products. However, protein chip segment is anticipated to grow at a significant CAGR of 12.9% during the forecast period. The applications covered in the study include drug discovery & development, disease diagnostics, genomics, proteomics, agriculture, and others. Depending on end user, the market is categorized into biotechnology & pharmaceutical companies, hospitals & diagnostics centers, academic & research institutes, and others. Among these, the biotechnology & pharmaceutical companies segment held maximum share in 2017, and is anticipated to grow at a significant CAGR of 10.7%. However, the academic & research institutes segment is expected to register high growth rate during the forecast period. Region wise, the market is studied across North America, Europe, Asia-Pacific, and LAMEA. North America held the largest share of the market in 2017, followed by Europe. On the other hand, Asia-Pacific is anticipated to dominate the market during the analysis period, owing to presence of large population base, increase in disposable income, and improvement in patient awareness about biochips. The key players of this market include bioMérieux SA, Bio-Rad Laboratories, Inc., Fluidigm Corporation, F. Hoffmann-La Roche AG, HORIBA, Ltd., Illumina, Inc., PerkinElmer, Inc., QIAGEN N.V., Randox Laboratories Ltd., and Thermo Fisher Scientific Inc.
Other players (these players are not profiled in the report, however, the same can be included on request) in the value chain include Micronit Microfluidics BV, OriGene Technologies, Inc., ANALIS SA/NV, AMS Alliance, and Dynamic Biosensors GmbH. 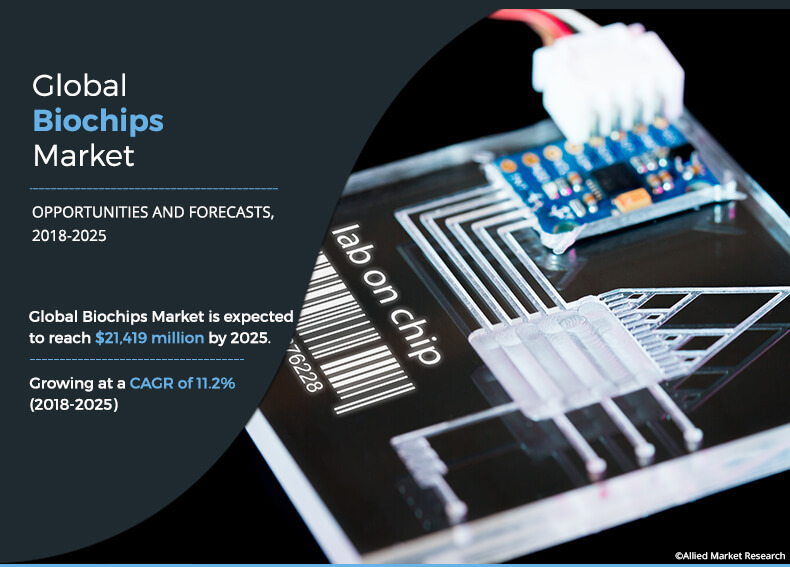 The study provides an in-depth analysis of the global biochips market along with current trends and future estimations from 2018 to 2025 to elucidate the imminent investment pockets. Biochip is a small specimen chip or tray on which biological molecules are placed for biotechnological analysis. It is designed based on microarrays or microfabrication technologies. It is made up of glass, silicon, polymers, and aluminum material on which individual biological molecules such as NA, RNA, peptides, proteins, are immobilized on the surface. On the basis of biological molecules that are immobilized, biochips are differentiated into various categories such as DNA chips, protein chips, lab-on-chip, and others. Biochips are widely used in multiple medical and pharmaceutical applications as well as in the food industry and environmental safety procedures. The adoption of biochips is expected to increase in the near future, owing to high prevalence rate of cancer, immunological diseases, and viral infections; rise in geriatric population; increase in biochip applications; and surge in demand for personalized medicines. These devices have gained significant popularity among patients as well as healthcare providers, as they are easy to operate and offer a host of benefits. However, high cost of biochips and lack of knowledge about biochips in emerging nations hamper the market growth. North America witnessed the highest sales of biochip products, owing to increased awareness toward microarrays-based products and heavy expenditure by the government on improving healthcare, followed by Europe and Asia-Pacific. 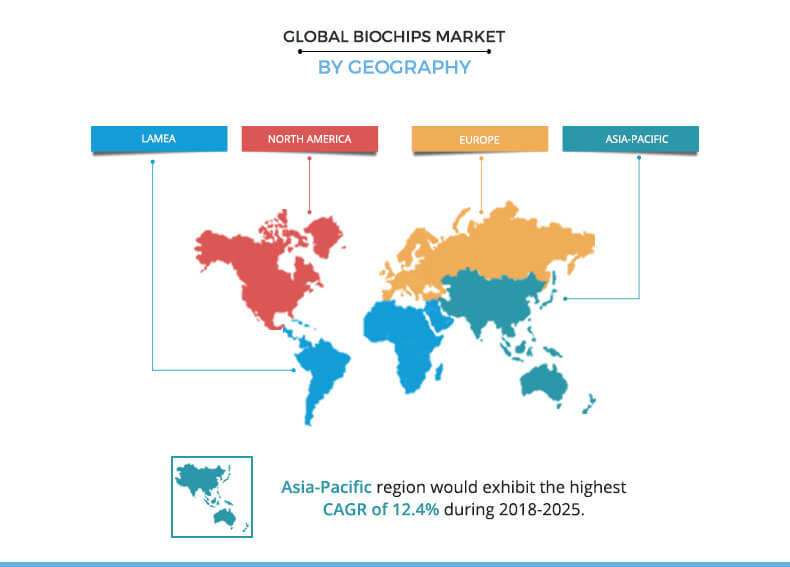 In addition, manufacturers and distributors of biochip products have focused on expanding their presence in emerging economies, which is expected to drive the market growth.